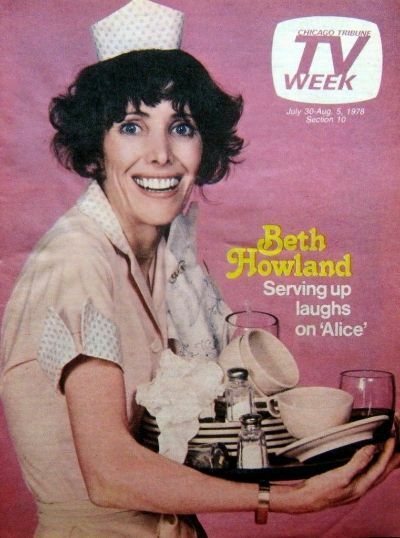 Beth Howland, the actress best known for her role as a ditzy waitress on the 1970s and ‘80s CBS sitcom “Alice,” has died. She was 74. Her husband, actor Charles Kimbrough, told The Associated Press that Howland died Dec. 31. He said there had been no announcement, funeral or memorial service because that’s how she wanted it. “That was her choice,” he said. Small roles on “The Love Boat” and “Little House on the Prairie” followed and a major break came when she was cast as Vera Louise Gorman on “Alice,” a comedy set in an Arizona greasy spoon diner based on the 1974 Martin Scorsese film, “Alice Doesn’t Live Here Anymore.” Howland earned four Golden Globe nominations during the comedy’s 1976-85 run for her performance as the naive Vera. I used to love "Alice" and always enjoyed Vera. I always remember watching (and enjoying) her suddenly destroying the box of straws in the show's opening credits. Although I never saw her on Broadway in the show Company, her rendition of "Not Getting Married" is pretty amazing. I don't know how anyone can sing and speak that fast without messing up.